The scientific community involved with seismic isolation was saddened to learn on the passing of Bill Robinson on August 17, 2011. Dr. Robinson, Fellow of the New Zealand Royal Society and founder of Robinson Seismic Inc., was a scientist and seismic engineer and inventor of the lead-rubber bearing (LRB) seismic isolation technology. We would like to make a special tribute to Dr. Robinson by republishing one of his fundamental papers, introduced by a foreword that was prepared by the author himself when SIAPS was launched in 2010. Bill, you will be sadly missed. Once upon a time — well, actually, April 1970 — in a New Zealand tea room, Bill met Ivan... and that was where this particular adventure in seismic isolation began. Bill — Dr. Bill Robinson — and Ivan— Dr. Ivan Skinner — were both members of New Zealand's Department of Scientific and Industrial Research, and the tea room in question was part of its Physics and Engineering Laboratory (PEL) on the Gracefield Campus near Wellington. Ivan, head of Engineering Seismology, had briefly returned to New Zealand from a sabbatical in Japan, and told Bill of how he proposed to use steel dampers in the seismic isolation of the new design office being planned for New Zealand's Ministry of Works (MOW), known as the William Clayton Building. 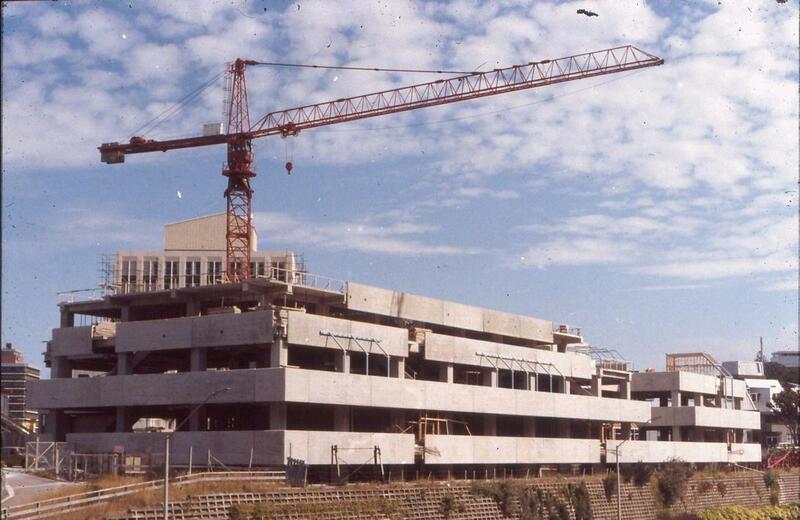 William Clayton Building under construction, 1981. Bill thought he could find a better material for damping than steel, so he went back to his office and spent the next two hours looking carefully for an element that had a relatively low melting point (∼300°C), was face-center cubic (fcc), was readily available at a high purity (impurities ≤100 ppm) — and all at a reasonable price. The only element that met these demands was lead. Its relatively low melting point ensured that any plastic deformation would be healed at room temperature by the interrelated processes of recovery, recrystallisation and grain growth, while its fcc meant there would always be a slip system available to accommodate any deformation and its high purity would see to it that the plastic deformation could be maintained and results would be consistent. The next problem was how to deform lead so that a relatively large damping force of 1 to 100 tonnes could be produced. The solution was a lead extrusion damper (LED). This thinking culminated in twenty-four 25 tonne LEDs (±400 mm) being manufactured and tested by PEL to provide the damping for seismically isolating the Wellington Central Police Station. This 10-storey tower block is supported on long piles in caissons founded 15m below ground in weathered greywacke rock. The near surface-soil layer consisted of marine sediment and fill of dubious quality. Bill and his technician Alan Tucker operating the MASHER. The LED, however, was not an elegant solution for damping the MOW's William Clayton Building, so instead Bill started trying to make a lead shear damper. But, no matter what the shape, they always failed after one quarter of a cycle. Obviously they needed to be supported in some way. As recorded in Bill's lab book, the solution, which occurred to him at home on 2 April 1975, was to place a lead plug through the layers of steel and rubber. 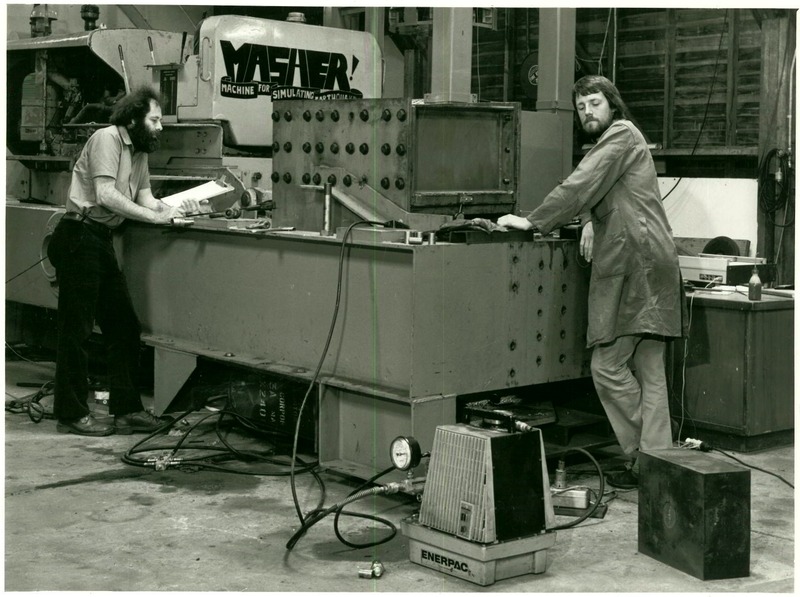 It was not until April 1977, though, that his team was able to obtain two cemented laminated rubber bearings from the Engineering Seismology Section, have the workshop drill a 56mm diameter hole in one, press a lead plug in the hole, and test both in an Instron testing machine. The results were so promising that Bill immediately contacted the MOW engineers working on the design of the William Clayton building and they decided to sell PEL an old D8 Caterpillar tractor to use as the basis of a test machine. PEL sold the tractor's blade for more than the cost of the tractor itself and the engineering design team, led by Cam Smart, designed a rig powered by the >100 KW diesel engine, capable of providing a vertical load of 300 tonnes and a displacement of up to 91 mm. Bill then tested a series of bearings of progressively increasing diameter, until at a lead diameter of 170 mm, after two cycles the gearbox failed! This result was viewed by all as a success and enabled the project to proceed. Today thousands of buildings and bridges worldwide use the lead-rubber bearing. [Kelly et al. 2011] T. E. Kelly, R. I. Skinner, and W. H. Robinson, Seismic isolation for designers and structural engineers, Robinson Seismic Ltd., Petone, New Zealand, 2011. [Skinner et al. 2003] R. I. Skinner, W. H. Robinson, and G. H. McVerry, An introduction to seismic isolation, Wiley, New York, 2003. 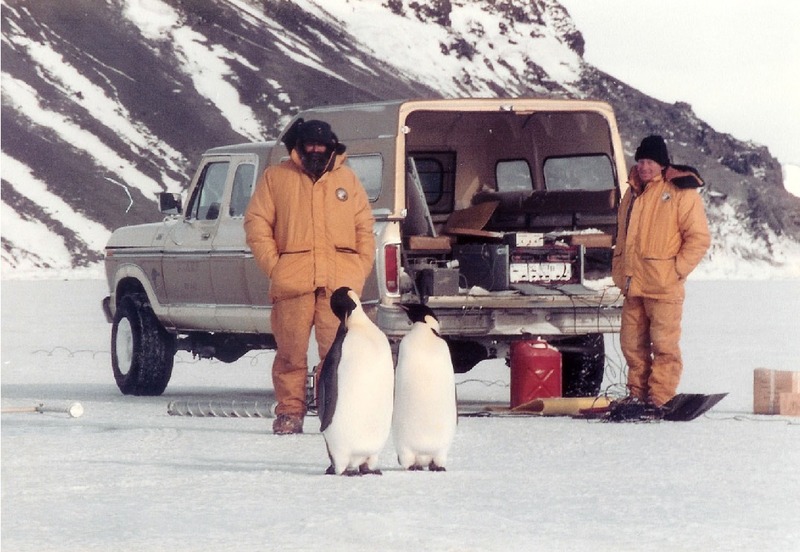 Bill and his colleague, Dr. Michael Staines, on the sea ice at Tent Island, McMurdo Sound, Antarctica, near Scott Base. The final version of the paper reprinted on the next few pages was written while Bill was a research fellow at Scott Polar Research Institute, Cambridge, England learning about sea ice.